I can’t tell you how resistant my family was to seeing this film. From the previews it looked like nothing more than a cutesy money-driven sequel aimed at children young enough to want to run to the store to buy a plush Minion doll or grab a Minion onesie off the rack to wear to bed. Turns out it is a cute film, sure to please the little ones. But Minions is also surprisingly clever, with enough allusions and smart one-liners to keep older children and adults amused as well. 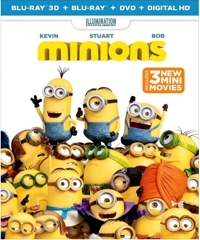 Instead of a sequel we get a creative and funny origin story that explains where the Minions came from and how they came to serve Gru (voiced by Steve Carell)—the villain from Despicable Me (2010) and Despicable Me 2 (2013). Would you believe they’re prehistoric? That they evolved (barely)? And that their entire purpose for living is to serve the most despicable master they can find? Good, because that’s the premise. After a series of hilarious historical background scenes, we get to the present day and see how the little yellow guys with limited language skills manage to tap into a secret TV channel announcing a villainous version of Comic-Con. Since the Minions seek a new villainous master, this comes as a revelation, and they head for the convention in Orlando, Fla., hoping to find just the right one. Once there, like baby birds imprinting, they glom onto the deadly Scarlet Overkill (Sandra Bullock) and her partner Herb (Jon Hamm). The last name will bring a smile to gamers’ faces, as it alludes to Overlord: Minions, a 2009 Nintendo DS game. The voice actors really have a lot of fun with this film, and while Minions may not be as original or creative as Pixar’s Inside Out, it’s nearly as entertaining. Set in 1968, it features a lot of period gags. And while there comes a time toward the end of the second act where you begin to wonder whether the Minions are strong enough characters to carry a film, the third act pulls it all together. Scarlet gives the Minions a test they need to pass, a Herculean task: to steal St. Edward’s Crown from the Tower of London. If they succeed, she will accept them as her very own minions. If they fail? It’s off with their heads. 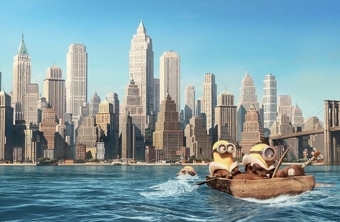 The stakes are high but it’s hard to take anything seriously when three Minions—Kevin, Bob, and Stuart—bumble their way across London. And when Bob pulls the Excalibur from the stone? Suddenly he is crowned ruler of England instead of Scarlet . . . and you didn’t want to make HER angry. Gru eventually makes an appearance, but for the most part it’s all about Kevin, Bob, and Stuart (voiced by co-director Pierre Coffin) and their encounter with would-be masters Scarlet and Herb. Sight gags abound, so even children too young to get the verbal jokes will have plenty to laugh about. Movie fans will have flashbacks to any number of films as the three hitchhiking Minions are picked up by a family (Michael Keaton, Allison Janney) that turns out to be headed to Villain-Con themselves . . . as villains. It’s a fun origin film, and our family enjoyed it only a little less than the original and a lot more than the sequel. This is the 3D combo pack, and the 3D version is a mixed bag. Children will love how often objects break the plane of the television monitor or how things like lava guns seem to be poking right at you. But the depth of field isn’t as good as Disney-Pixar’s recent release of Inside Out, and the lighting could be better. It’s fun to watch with the glasses on, but if you don’t already have 3D capability and are wondering whether to buy the 3D to prepare for the future or go with the standard Blu-ray, I’d have to say that I enjoyed the Blu-ray at least as much—maybe even more, because of the brightness factor. 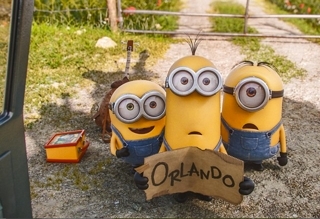 As it turns out, Minions did better at the box office than either of the first two films—more than $1.1 billion worldwide, making it the second highest animated feature ever (behind Frozen). And for a bunch of little yellow guys, that’s a pretty big deal—whether in 3D or 2D. How do you jazz up an otherwise common story about a young girl who has a hard time adjusting to her family’s move from Minnesota to San Francisco? 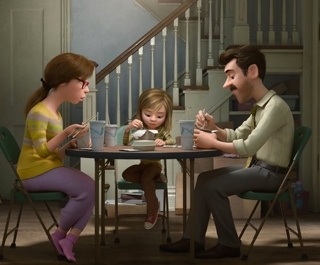 If you’re Pixar, you personify her emotions and show them inside a control room interacting with each other as young Riley experiences a range of different and sometimes complex and conflicted feelings. 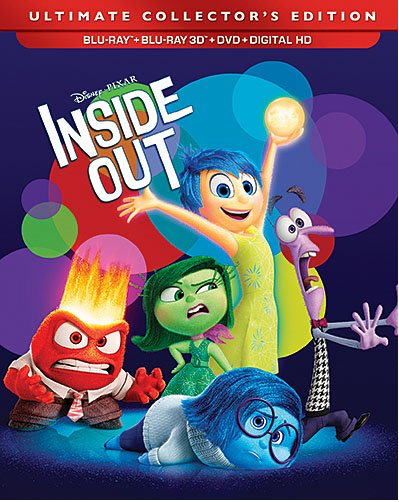 And you give those cartoon-character emotions a save-the-day mission that turns the focus of this film Inside Out. First-time animated feature director Ronnie Del Carmen is paired with Minnesotan and seasoned director Pete Docter (Up, Monsters, Inc.) for this CGI animated comedy-drama-adventure—the 15th full-length from Pixar and the studio’s first since 2013’s Monsters University. 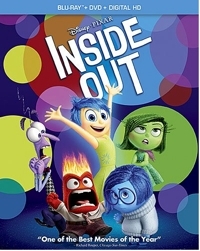 Inside Out is a clever film about the inner self, but “clever” is the operative word. As creative as the concept is, for some reason it’s not as easy to become as emotionally involved with the characters as it has been with previous Pixar movies—which is ironic, since the main characters ARE emotions. People familiar with the old Sunday night Disney TV shows may be reminded of the Ludwig von Drake episodes in which Professor Von Drake explained various scientific phenomena and mechanical functions through the use of illustrated cartoons. That’s how Inside Out feels: Here ist how za emotions verk inside za body! The concept is introduced when Riley is born and we see emotions in a control room looking up at the parents from Riley’s point of view, so we understand instantly that the baby’s first expression of delight is linked to the anthropomorphic character in the control room. Joy (voiced by Amy Poehler) is behind all of Riley’s joyful reactions, the one responsible for her smiles and laughter. Score a goal later in life, as this young hockey player does, and it’s pure Joy! Sit in a new classroom feeling suddenly alienated, and that’s where Sadness (Phyllis Smith) steps in. Other core emotions are Fear (Bill Hader), Anger (Lewis Black), and Disgust (Mindy Kaling). Memories are represented by different colored balls, some of which are defined as core memories, ones that have a lasting impact. Older children will appreciate Pixar’s attempt to make sense of emotions and the human psyche, creating visuals to explain a complicated terrain that includes various “islands” representing collective memories of family on one and aspects of personality on others. Then there’s a memory dump where memories go to fade and die, a long-term memory repository, and a punning “train of thought.” Younger children may find such details may be too complicated to understand, but they’ll still likely get caught up in the action and the interaction between the emotions and the ways in which they are reflected in the life of Riley (Kaitlyn Dias). There’s a message here among the memories, and it’s simple: while Joy may be the most desirable, other emotions have their place—especially sadness, whose primary function is to alert Joy when someone needs to be comforted or lifted up out of their funk. 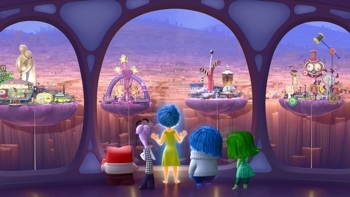 Inside Out is an ambitious attempt to make sense of children’s feelings and to help them understand those feelings. How successful is it? That depends on whom you ask. My wife and I enjoyed the film but didn’t think it ranked among the best that Pixar has made. We gave it a B. Our teens—maybe because teens are so aware of their emotions—thought it was an A- because “it was different, it was creative.” And yeah, it’s hard to argue with that. 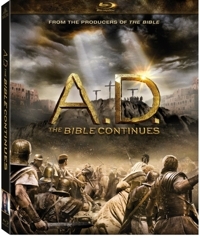 3D option: If you have 3D capability, get this title in the 3D combo pack, which includes a Blu-ray, DVD, and Digital HD. It’s by far one of the best 3D presentations I’ve seen. Things may not fly out at you the way they do at Disney’s 3D theme park shows, but the spatial depth created and the superior edge delineation really adds a lot to the viewing experience. In fact, Inside Out seems the kind of movie that was made for 3D. As of November 23, it’s on sale at Amazon for $25.19, and that’s only three dollars and change more than the standard Blu-ray combo pack. If you want to hedge your bets in case you might decide to get 3D in the future, it’s well worth the upgrade. Give me an imaginative origin story over a reboot any day of the week. Especially if Guy Ritchie (Sherlock Holmes) is sitting in the director’s chair. For four years in the sixties, Robert Vaughn and David McCallum starred on NBC-TV as Napoleon Solo and Illya Kuryakin—American and Soviet special operatives working for Alexander Waverly’s top-secret international counter-espionage agency known as U.N.C.L.E. (United Network Command for Law and Enforcement). It was the TV version of the James Bond films—a campy serialized spy adventure that aired during the Cold War but sidestepped the polarization between two superpowers and instead had U.N.C.L.E. facing off against T.H.R.U.S.H., just as the Bond films introduced SPECTRE as the nemesis organization. 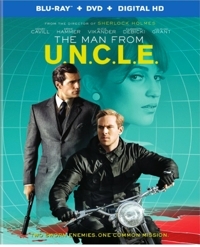 In this 2015 film version of The Man from U.N.C.L.E. we get the story of how the two Cold War enemies came to work together and see how their very different backgrounds and personalities made them reluctant partners in the tradition of the very best buddy cop movies. A scientist whose work could change the balance of world power has disappeared, and the Soviets and Americans realize that this is one time they must work together to keep such power out of the hands of rogue states. 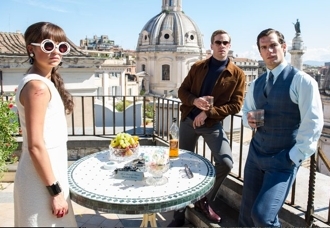 After almost killing each other in an opening sequence, Solo (Henry Cavill) and Kuryakin (Armie Hammer) are ordered to partner for the good of humankind, and they go to Italy to work undercover and try to locate the scientist through his daughter Gaby (Alicia Vikander) and her uncle—playful pun intended, I’m sure. There’s plenty of action in The Man from U.N.C.L.E., but, just as important, the film manages to capture the tongue-in-cheek campy fun of the original series. In one scene, for example, Solo sits in a vehicle eating a sandwich and drinking wine while viewers see Kuryakin struggling with the bad guys in the distance. There’s plenty of banter, too, concerning the preferred Russian way and the American way of doing things and plenty of digs at each other’s competency. When Solo is about to open a safe and Kuryakin asks, “Did you disable the alarm?” Solo smugly replies, “There’s no alarm on the 307.” RINGGGG!!!! “Loving your work, Cowboy,” Kuryakin deadpans. Cavill, Hammer, and Vikander have good chemistry together, and that helps to fill any voids when the action subsides. Even Hugh Grant, working with a very small role as Waverly, manages to get into the act, and Elizabeth Debicki really nails the glamorous Bond-style femme fatale down. The Bond films always offered glimpses of exotic places and that was a part of their appeal. Ritchie understands that and provides a generous amount of panoramic long shots of Italy, where parts of the movie were filmed. A funky, hip soundtrack adds to the fun. Yes, there are familiar elements here, from the nuclear scientist to the psychotic torture expert, but everything comes together incredibly well. It’s formulaic, it’s familiar, it’s a popcorn movie, but who cares? It works. Max, released in 2015 and distributed by Warner Bros./MGM, is a family film that my family refused to watch. Why? Because they’d seen the trailer and had no interest in a movie about a U.S. soldier killed in action whose dog mourns him and has a hard time adjusting to life afterwards. They wouldn’t watch Marley & Me either, and as for Old Yeller? Forget it! No sad movies involving dogs! 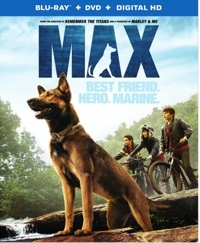 So I watched it alone, thinking that for families that aren’t resistant to tearjerkers, Max is a good choice for movie night. Though it’s a little heavy-handed at times and sprinkled with occasional cheesy lines, it’s an engaging patriotic film, it’s an incredible journey for one dog, it’s a thriller involving piracy and gun-running, and it’s a coming-of-age story about a young boy who doesn’t care about anything besides his video games, when we first meet him. Newcomer Josh Wiggins stars as low-end teen Justin Wincott, who learns in short order that his older brother serving in Afghanistan was killed. But viewers already know that, because the first act acquaints us with Kyle (Robbie Amell) and his relatively unusual assignment. He’s a dog handler, and this film is dedicated to the 26 dogs and 25 handlers who died in battle. 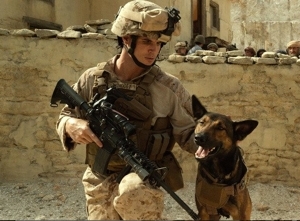 Viewers see how dogs are used to walk ahead of troops to make sure it’s safe and also to sniff out weapons caches—though to give the screenplay a little Hollywood twist, Kyle’s best friend, Tyler (Luke Kleintank), is mixed up with a gun-smuggling operation. But Max is the focus, and the scene my family saw on the trailer is one that will jerk plenty of tears out of you, as this Belgian Malinois (think German Shepherd) is brought to the funeral and lunges at the casket, putting it’s front paws on it, then slumps to the ground. After that, it’s a story about how Max gets over his post-traumatic stress syndrome and loss of owner through Justin, whom he senses is a blood relative to his beloved Kyle. As happens with the dog in Air Bud, Max is also the agent by which his new young and reluctant handler comes out of his shell and, in this case, straightens out. Mia Xitlali appears as Carmen, the somewhat clichéd feisty Latina who just happens to be visiting her cousin Chuy (Dejon LaQuake), Justin’s best friend. Not only do you get attitude with this girl, you get a potential first-love interest and a dog whisperer who helps Justin learn how to click with Max. But a story that’s essentially about a dog and teens needs a few adults to anchor it, and Thomas Haden Church (Sideways, Broken Trail) and Lauren Graham (Gilmore Girls) fill the bill. There are some surprises and there are some familiar plot devices, which collectively make Max a B-range movie because it ultimately succeeds at what it attempts. 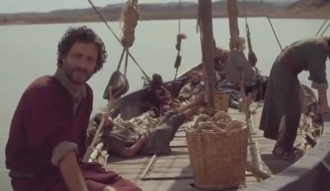 The acting is decent, the production values are decent, and the script is decent enough. If you ignore those occasional clunker lines and familiar turns, Max is an exciting, feel-bad feel-good film. Takeaway: Family movies can be corny and predictable, but this one actually has some surprises, and there are enough exciting moments to balance the cheesy ones.